Del Webb at Union Park is one of the newest 55+ communities located within a master-planned community in North Texas. Active adults increasingly want to live near family. The New York Times calls it a growing phenomenon for active adults to want to live near their adult children. Not only does this allow retirees to more easily get help from their family members if they’re not entirely independent, but it also supports a vibrant lifestyle. Active adults can share life with their loved ones without needing to travel far and fend off loneliness and isolation that retirees often experience. In Dallas-Fort Worth, active adults can explore a variety of age-restricted neighborhoods situated within master-planned communities. By living in one of these neighborhoods, active adults get an ideal mix of enjoying family nearby along with the plentiful amenities and social environment of a 55+ community. Browse our list below to learn about where to retire if you have family in Dallas-Fort Worth. In Isabella Village at Savannah, active adults enjoy the benefits of living in an age-restricted community along with the rich line-up of resort-style amenities offered within the larger setting of a master-planned community. Residents in this 55+ neighborhood situated with the master-planned community of Savannah have full access to the offerings of Savannah’s multi-age environment. They can take advantage of a clubhouse, sports courts, lakes, picnic areas, and fitness complex. The 20,000 square-foot Club Savannah serves as the community’s hub, featuring a cafe with a juice bar and a three-story fitness center complete with saunas and marble locker rooms. Homeowners in Isabella Village at Savannah can also enjoy Club Isabella, their own private clubhouse with its own set of resort-style amenities. Active adults can meet neighbors and make new friends through a variety of organized events ranging from poker and bingo to yoga and Zumba. Residents can also stay socially connected and mentally sharp through mental aerobics or matinee movies. Active adults who want to live closer to family in Dallas-Fort Worth will find an appealing variety of ranch homes in Isabella Village. Floor plans range from 1,212 to 2,398 square feet, with many homes richly appointed with custom features and high-quality finishes such as custom oak cabinets, granite countertops, and built-in Energy Star Whirlpool appliances. Upon completion, Isabella Village at Savannah will contain 180 single-family, energy-efficient homes set inside the multi-age community of 7,000 homes in Savannah. If you have family in Dallas-Fort Worth, Viridian Elements, the newest addition to the Viridian master-planned community in Arlington, offers an exceptional quality of life. Spread across 141 acres, this 55+ community has plans for 500 single-family and courtyard homes that are available in a mix of styles and sizes. At the clubhouse, active adults can converse with like-minded others over the game tables or a friendly game of pool. A demonstration kitchen is an ideal setting for special events and gatherings and a fitness center provides plenty of opportunities for active adults to stay physically fit. Within the Viridian master-planned community, homeowners can enjoy a wider assortment of amenities open to all ages, including the Viridian Lake Club, which includes four sparkling pools. Homeowners can take a nature walk with grandkids through a 150-acre wooded conservation area where they can also fish or bird-watch. With 850 acres of open space and a dog park, active adults can enjoy the great outdoors with the whole family. Residents can also browse unique goods and take part in fun activities at the Viridian Artisan Market, which brings neighbors and visitors together to foster community and social gathering. 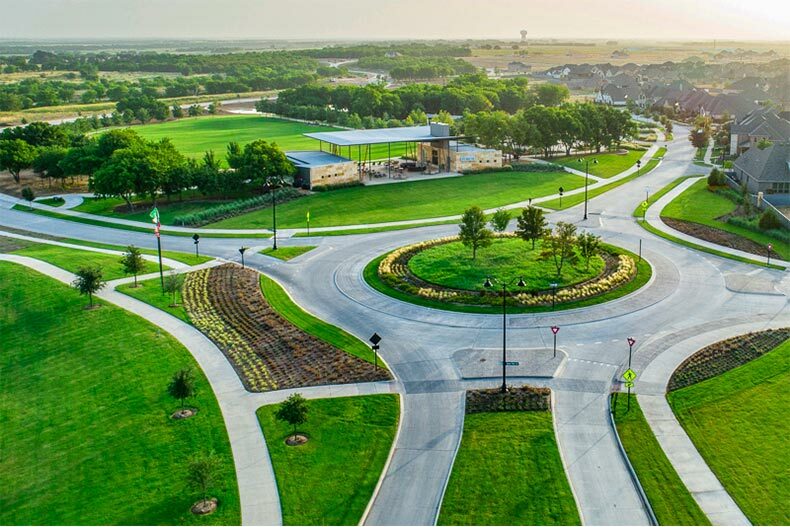 Situated within a master-planned community in Little Elm, Del Webb at Union Park stands out as a gem for active adult homebuyers who want to live near family in Dallas-Fort Worth. This brand-new, age-restricted community offers active adults a coveted blend of stylish homes and a fun-packed lifestyle. Here, retirees can stay as active as they like, whether they pursue their favorite hobbies, pick up a new skill, or enjoy activities with their kids and grandkids. The clubhouse offers many desirable amenities, including a resort-style outdoor pool, tennis and bocce ball courts, and a fitness center that allows residents to stay in shape. Homeowners can socialize and mingle with others in a variety of activities, such as painting and cooking classes. With walking trails winding through the community, active adults can also go for a morning jog or take their grandkids on a peaceful after-dinner stroll. No matter what kind of features and design active adults have in mind for their home, they can find a style to suit their preference and budget at Del Webb at Union Park. Single-family homes in this age-restricted community range in size from 1,400 to 2,500 square feet. The neighborhood contains 600 homes in 10 different styles and floor plans, giving active adult homebuyers plenty of options.